Notre Dame de Paris is a Roman Catholic cathedral located in Paris, France. It is the seat of the Archbishop of Paris, and is a well known French cultural and national icon. Notre Dame is located on the southeastern part of the Île de la Cité, the historic heart of Paris. This location has been used for religious purposes going back to the time of the Roman Empire, when the Gallo-Roman boatmen erected a monument to Jupiter there. During the Christian era, the site was used for two Romanesque style churches, which were eventually demolished. The church was first conceptualized in 1160 by bishop Maurice de Sully, who made the original plans. Construction of the church officially began in 1163, and Pope Alexandre III was present at the ceremony to dedicate the first stone. As was typical of such large construction projects of the day, it took about 100 years to complete. Most of the work was finished around 1250, but there was no ceremonial setting of the last stone, and small work projects continued well into the 1300s. Portal of the last judgement. The architecture of Nore Dame is early Gothic. It is interesting to note that architectural styles were changing at the time of construction. One visible result of the long process of construction, is that the church incorporates several different styles, the oldest being at the east end of the church, and the newest being the towers on the west end. Today it is considered a kind of hybrid building, and it is one of the first Gothic cathedrals ever built. In the center of the west entrance are three portals depicting several Biblical scenes. The center one is the Portal of the Last Judgement, where an image of Christ is clearly visible. Above His head, statues of heavenly hosts are praising Him. Underneath Christ the archangel, Michael, can be viewed "weighing the souls" of the dead. The Devil can be seen pulling the dead to the left, and into Hell. On Christ's left is John the Baptist, and on His right the Virgin Mary. To the left of the Portal of the Last Judgment is the Portal of the Virgin. Mary is on her death bed and angels are raising her into Heaven. There Mary is crowned the Queen of Heaven. The third of the portals is the Portal of Saint Anne, on the far right. The Virgin and Child are seated on a throne in the center of the arch. Along with the Virgin and Child, a Bishop of Paris and the King of France are present. Neither statues have been exactly identified as to whom they may be. Several notable events have occurred within the church of Notre Dame. The Third Crusade was called for in 1185, and it was also the location of many royal weddings and coronations. The most notable coronation took place in 1804, when Napoleon Bonaparte crowned himself emperor. Beginning in 1789 and throughout the French Revolution, Notre Dame became a target of vandalism, since many people in Paris considered the church a symbol of the old regime. The church was looted, and many of the statues were broken down, including the 28 statues of the Kings' Gallery, located just above the main portals on the western facade. These kings were originally mean to represent the kings of Judah, but they were misinterpreted as kings of France. 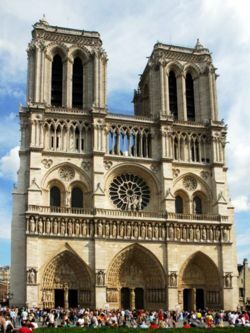 As part of the anti-Christian aspect of the French Revolution, the Roman Church was deposed from the building, and Notre Dame was declared a "Temple of Reason". By the 19th century, French author Victor Hugo became fascinated with the cathedral, and lamented the fact that it was in such disrepair. He wrote his now famous novel Notre Dame de Paris (commonly known to the English-speaking world as The Hunchback of Notre Dame) in part to express these concerns. The novel was heavily critical of certain aspects of French society, including the public apathy regarding the state of the church. As a result of the immense popularity of the novel, a great restoration effort was initiated. The restoration was led by a French architect named Viollet-le-Duc. Much of the modern appearance of the cathedral is a direct result of his restoration. The great spire located over the crossing is entirely le-Duc's creation. On April 15, 2019, the cathedral was badly damaged by a massive fire. Meichtry, Stacy; Schechner, Sam (April 15, 2019). Fire Ravages Notre Dame Cathedral. The Wall Street Journal. Retrieved April 18, 2019. Lane, Oliver JJ (April 15, 2019). Paris: Notre-Dame Cathedral Burns, Charred Timbers of Medieval Spire Collapse. Breitbart News. Retrieved April 18, 2019. Shaw, C. Mitchell (April 15, 2019). Notre Dame Cathedral Being Destroyed by Fire. The New American. Retrieved April 18, 2019. Notre Dame Cathedral Burns in Paris. The Wall Street Journal. April 16, 2019. Retrieved April 16, 2019. Shaw, C. Mitchell (April 18, 2019). Why the Certainty That Notre Dame Fire Was Accidental? The New American. Retrieved April 18, 2019. This page was last modified on 18 April 2019, at 21:33.